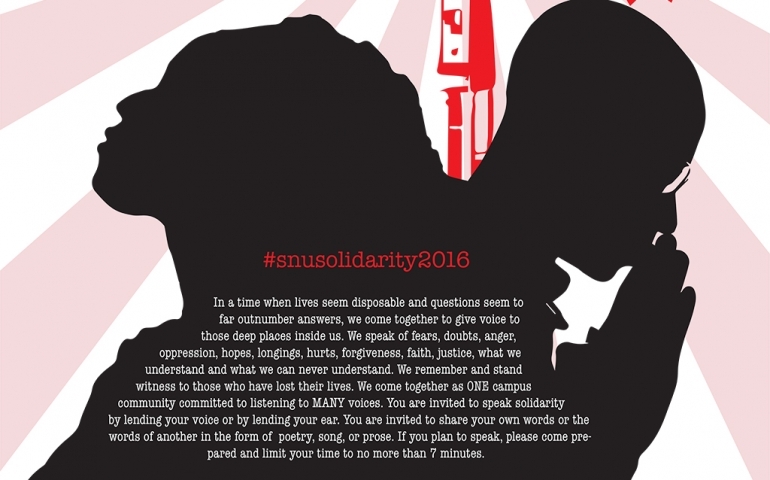 On Thursday, October 13th from 8:30- 10:00p.m., the department of Cultural and Communication Studies will be hosting the first “Speak Solidarity” event in the SNU library coffee shop. Dr. Gina Weaver, a professor of English, says the inspiration for the event came after the death of Terence Crutcher, who was killed in Tulsa several weeks ago. After talking to other faculty members and students, she and others felt this was an issue they had to address . She went on to say, “It is going to be time to stand witness to what’s happening right now- and what has happened, historically- and what’s continuing to happen. I don’t mean to make it sound like recent police violence against minorities is anything new, it’s not.” She concluded by saying that all are welcome to both share and listen. This event is open to all SNU students, and alumni, with its main purpose being to provide a safe space to share openly in the form of poetry, song, or prose, as well as to educate, make aware, and hear from one another- listening and learning from each others’ heartbreaks.